Most records are still sealed , and many are now out-of-print and difficult to find. Although this is not a concise collection by far, it will be seemingly unlikely that another collector will offer theirs on the open market. All records have been described to the best of my ability; only several have been played and sound excellent. If someone doesn’t want to miss out and decides to pull the trigger, that’s fine too. These records will only increase in value so it’s an investment. I already have heavy-duty boxes, but its going to take a tremendous amount of bubble-wrap and inserts to secure the package and its contents. Its all very costly, so please be understanding. Note: pictures soon to follow.. OPENED/UNPLAYED LIMITED TO 300 COPIES Zombie Flesh and Blood. 3 Friday the 13 th Part II. 4 Clive Barkers Nightbreed (Deluxe LP). SEALED Blood Red and Black Marble. 8 Nosferatu the Vampyre (2 x LP). SEALED White Marble Castle Wall. SEALED The Revenge Of The Lawn Gnomes Green on Green Splatter (Disc 1) & The Werewolf OF Fever Swamp Gray and Blue Splatter (Disc 2). SEALED LIMITED TO 500 Slappys Revenge White and Gray with Red Splatter (Disc 1) & The Blob That Ate Everyone Pink with Red Splatter. SEALED Glass Unicorn with Soroity Sister Blood Splatter. SEALED Glass Unicorn Clear. 11 KRAMPUS (Double LP). SEALED Dark Elves Picture Disc(s). ALL VARIANT SUBSCRIPTION RECORDS ARE SEALED. 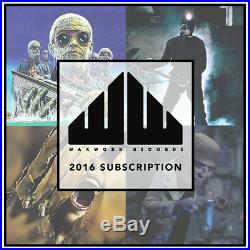 Five Deluxe soundtracks on EXCLUSIVE colored vinyl including: SHOCK WAVES; MY BLOODY VALENTINE; MAD MONSTER PARTY; THE HOWLING; and the secret release of ALTERED STATES Exclusive 2016 Subscription Member T-Shirt SIZE (L) Large Waxwork Records Logo Enamel Pin Exclusive 2016 Subscriber LP Tote Turntable Slipmat. 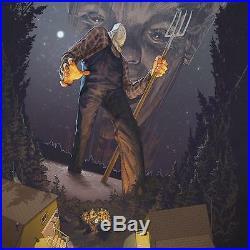 13 Friday the 13 th Part 3 (2 x LP). 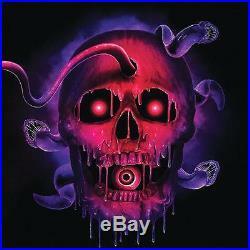 SEALED Deluxe 3-D Lenticular Variant. RED (Sides A & B) & Cyan (Sides C & D). SEALED Deluxe Hockey Mask (Variant). (2 x LP Blood Splattered Hockey Mask). 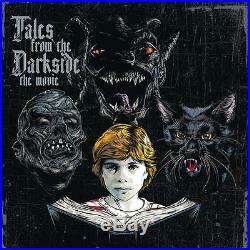 14 Tales From The Darkside. SEALED x 3 Three Variants Available (Lot 249 Mummy Spice, Cat From Hell Blue and Black, and Lovers Vow Gargoyle Green Swirl). 15 Taxi Driver (2 x LP). SEALED Taxi Cab Yellow. 16 The Warriors (Deluxe Double LP). 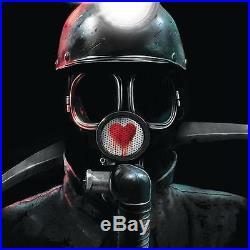 17 MY BLOODY VALENTINE (Double LP). SEALED Opaque Blood Red Vinyl. OPENED/UNPLAYED Purple and Violet Hallucination Swirl. 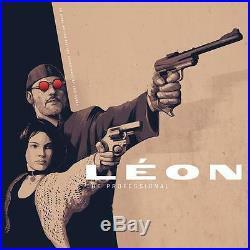 20 Leon The Professional (2 x LP). SEALED Upper East Side Splatter. Variant included in subscription. 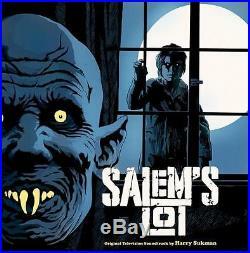 22 SALEMS LOT (Double LP). SEALED Vampire Blue, Yellow, and Black Cloak Swirl. 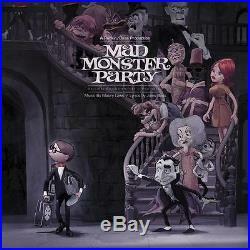 23 Mad Monster Party. SEALED Count Dracula (Black and Green Swirl). SEALED The Hunchback (Pink and Yellow Swirl). 24 Trick ´R Treat (Double LP). (Blood Red w/Silver Haze) Variant included in subscription. ALL VARIANT SUBSCRIPTION RECORDS ARE STILL SEALED. 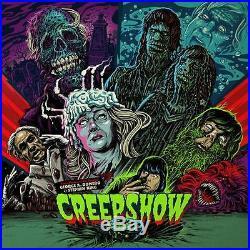 Five Deluxe Soundtracks: Creepshow 2 (Ships in 3-4 weeks) Evil Dead 2 The Babadook (TBA) Dont Look Now (TBA) Darkman (TBA) + WAXWORK x EVIL DEAD 2 Subscriber T-Shirt Size (L) Large CREEPSHOW 2 Screen Printed Poster Secret, Surprise Enamel Pin. Ice (Deep Blue w/White Haze). 28 PilotPriest (TRIPLE LP). OPENED/UNPLAYED NEON PINK, YELLOW, and GREEN. 29 Evil Dead 2. SEALED Ash (Blood Red, Blue, and Brown Swirl). SEALED Oldsmobile Delta 88 (Yellow). 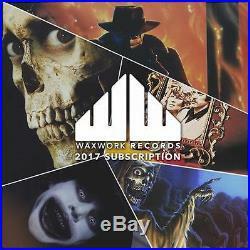 The item “Waxwork Records Vinyl Subscription Lot 50 Records Creepshow THING Evil Dead F13″ is in sale since Tuesday, July 25, 2017. This item is in the category “Music\Records”. 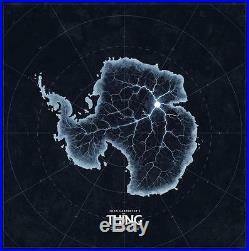 The seller is “greyson_silverfox” and is located in Lake Villa, Illinois. This item can be shipped to United States.